Update for October 2014: The great news is that the Stompee balance bike is BACK in the UK! It's now available and in stock right now! If the stompee is not available at the time you read this in the USA or Canada then we have similar alternatives if you are visiting from those countries, just follow the links below for your country. USA: Chicco Red Bullet Balance Bike (Review) or the Smart Gear Budget Balance Bike. 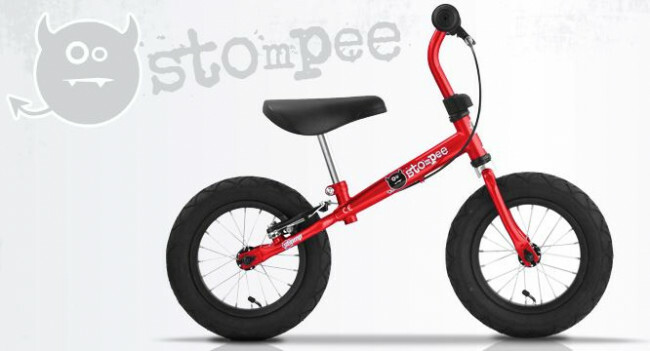 The Stompee is a nice looking chunky balance bike with a sturdy construction. It is made of high tensile steel coated with rugged paint to protect from rust during those winter nights when it is left out in the garden. Currently the Stompee balance bike is available is several colours. You have the choice between a Blue Stompee, a Black Stompee, a Pink Stompee and Red Stompee. There is enough colour variety for the fussiest toddler. A big plus of the Stompee is that it is very easy to construct this bike out of the box with supplied tools. However it is always best to use your own tools when building these bikes as the nut and bolt sizes can vary. The Stompee can come with either 13mm or 14mm bolts so the included spanner may not be a good fit. The Stompee is a very reasonably priced balance bike, I am reluctant to say that it is a cheap balance bike because that implies that the build is inferior, which is not true - this is a well-priced balance bike compared to others. In fact in most cases it’s the cheapest balance bike on the market. This balance bike is relatively heavy, which is a good thing when a toddler is learning how to ride. The weight helps keep the centre of gravity lower which makes it easier to ride. For example extremely lightweight adult bikes like specialist racing cycles are very difficult to master because of their lack of weight. No such problem here! These bikes do not have bearings in the steering which makes them relatively maintenance free. The steering system is made of tough plastic instead of steel metal which might rust – so again a good feature which will help the Stompee balance bike last a long time. The Stompee balance bikes arrive extremely well packaged so you can be sure there will be no damage in transit. The handlebars can come loose if not tightened correctly - people can tend to assemble them the wrong way around as they may look like they are back to front when they are in fact in the correct position. If your handlebars do not seem to tighten correctly then turn them around before contacting the company and see how that works for you. Look at the picture above of the Stompee bike to be sure that you have the handlebars in the correct position. There have been some reports of the Handlebar post actually being too small for the tube frame and it not being possible to tighten it. If this does happen to you and you are sure that the handlebars are the right way around, just use a rubber shim or strip of rubber or cloth around the handlebar post to widen it before fitting. This will provide a secure base for tightening the handlebar post. If the Seat post appears to be too small for the tube frame and impossible to tighten, again just use a rubber or cloth shim to increase the size of the post slightly before fitting it into the balance bikes tube frame and it should tighten without any problem. The brakes can be a little difficult to get right when building the Stompee balance bike. This is mainly because they are like real bike brakes which are quite hard to adjust - but don't worry! 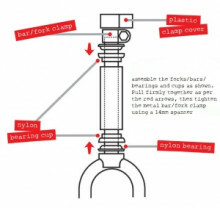 A full and detailed diagram is included in the box which shows you how to adjust bike brakes properly. We rate the Stompee Balance bike a three out of five for its very rugged build and low maintenance design – no need to oil this one at all if it’s left out in the yard on rainy days. We do take into account the cheap price (or should I say reasonable price) because some of the other balance bikes on the market are very expensive and high price does not always mean highest quality. These Stompees are great value – get one today! See the other top balance bikes we have reviewed. Very timely publication, as we’re right now in the process of putting a page together .